Playgrounds.net Blog: Why to Select Wooden Residential Playground Equipment? Why to Select Wooden Residential Playground Equipment? A recent survey has revealed that most parents in the United Stated prefer to install wooden playground equipment in their backyards. These play sets are not only a complete source of entertainment but are also considered safest for kids. It would not be wrong if we say wooden play equipment have an edge over other sets made of plastic, aluminum or metal. 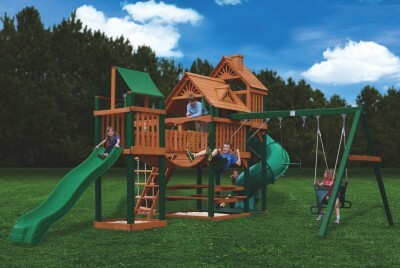 High quality redwood, timber, cedar are generally used by the manufacturers to construct the play sets. These are virtually splinter free and naturally resistant to rot, decay and insect, making the equipment strong and durable. Wood play sets can resist moisture up to any amount and can easily withstand UV rays and adverse weather conditions. These are considered stronger and have a long life as compared to metal, aluminum or metal equipment. Usually, metal playground equipment gets corroded and cracked after a period of time. Whereas wooden sets do not get corroded with rust and each piece of wood is used carefully to eliminate the scope of pointy edges that can cause injury to kids. Moreover, these are dimensionally accurate and stand firmly on the ground. Manufacturers strictly follow the guidelines defined by American Society for Testing and Materials (ASTM) and Consumer Product Safety Commission (CPSC) while constructing the wooden play sets. Many wooden residential playground equipment are available with many rooms and extra areas like tunnels that jazz up kids' fun time.